Joy Regardless: How I have found Joy regardless of the struggles I have been through. 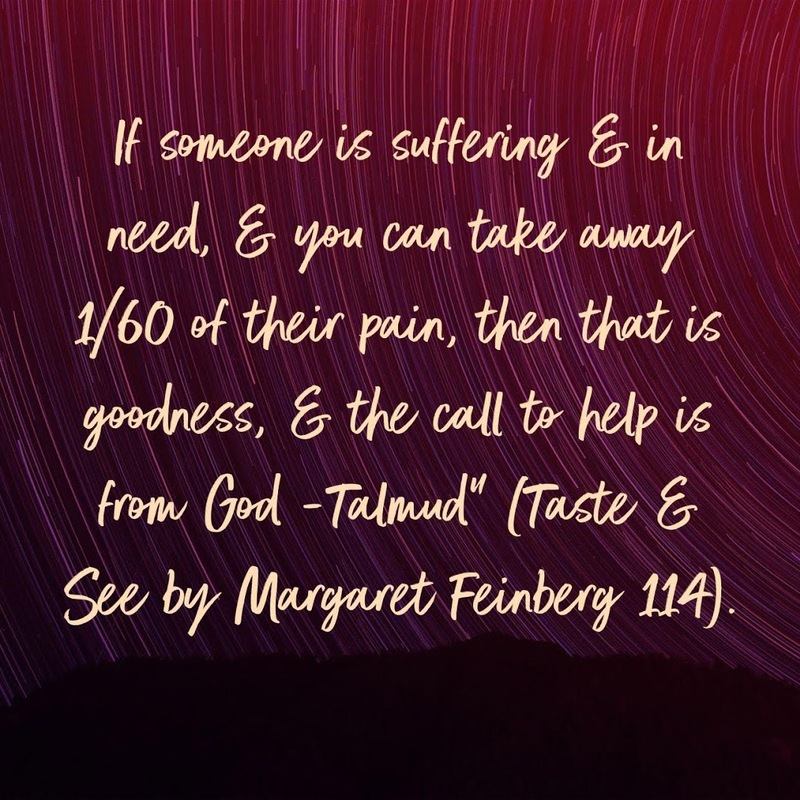 When I read this quote in #MargaretFeinberg's book #tasteandsee, Chapter 5: "A Dash of Sea Salt" (p. 114), I found myself having to stop and re-read it and then underline it and then share it on Facebook and then talk about it with my Sunday School ladies and now write about it here. My brain just won't let it go. 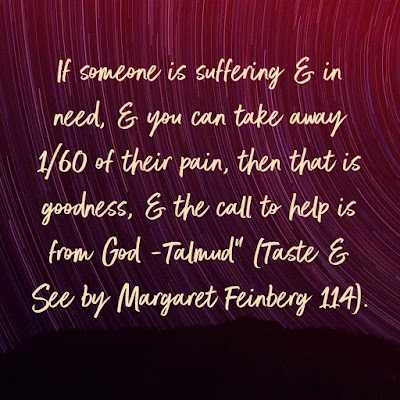 Thinking about how I can help take someone else's pain even just 1/60th can make a difference and how that is "the call to help from God" Himself is no small thing, my friends. We are all inspired by stories of kindness, aren't we? I hope we are. I get frustrated because there are so many other stories that aren't getting recognized, but that's not why we help one another, right? We do it because we feel that tug in our spirit--that "call to help from God." When I think about all the trials and struggles I have been through and the things that others have done for me to help ease my pain, I know they felt the "call to help from God" because they sure eased my 1/60th and then some. Once, after one of my miscarriages, a friend and her daughter brought a whole meal for my husband and me from Bojangles because she knew how much I liked their food. A friend went with me to a couple of my appointments to listen to my son's heartbeat--non-stress tests--during my only viable pregnancy because my husband was unable to go with me. 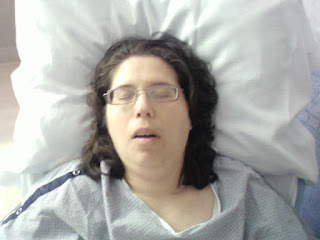 She chose to go with me rather than sleep during her hours of sleep time; she worked 3rd shift. someone sitting with me: friends, family, loved ones. Some drove from four hours away. Some came from across town. I was passed out and barely knew they were in the room, but they came and sat with me and prayed over me anyway. And when I finally came home, they were there to provide meals and to help me with my recovery in a thousand different ways. Back at work, my co-workers took over my classes without question and never bothered me or made me feel guilty for having to be out for two months sick. In fact, I'm sure there are things that people did for me during that time that I'll never know about simply because I was so sick. But God knows and each and every one helped that 1/60th ease my suffering. Over the past year, after leaving my beloved, cherished, treasured job, I have had many people hug me, hold me, sit with me, hold my hand, listen to me, let me vent, let me cry, walk with me and talk with me. People have helped financially. All of these could add up 60/60ths to ease my pain. I wish, but at least each has helped ease 1/60th. I wish I could list every single person who has hugged me and helped that 1/60th with his/her arms of love. Or the students I have met as I have been out and about town who have provided words of encouragement that have given me another 1/60th of easement. You know, we read books and we read books and we move on and may never think about the books we read again. If I get nothing else from this book (and believe me, I've already enjoyed the rest of it immensely), Taste and See is well worth reading. Every single book I have ever read by Margaret Feinberg has had a powerful impact on me and on my life in some way, shape, form, or fashion. I am not praising her, necessarily; I am praising her obedience to our Lord and Savior for writing and sharing what is on her heart. 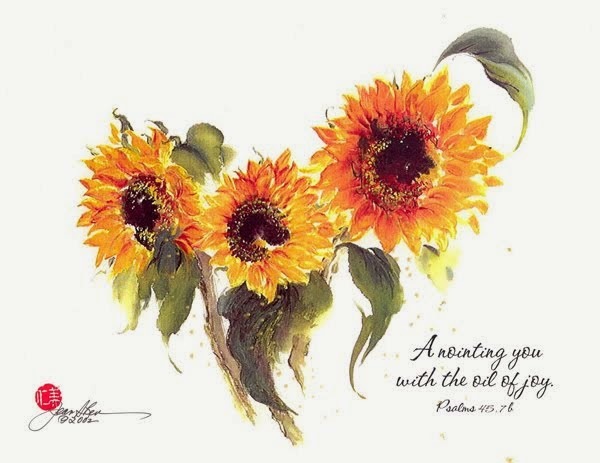 In this chapter in which she is writing about how even helping ease someone's burden 1/60th is a call from God, Margaret is talking about how we are the "salt of the earth": we are to go help preserve, flourish, and flavor the earth--those around us as Believers of Jesus Christ. How do we do that? By sharing one another's burdens even if in doing so, we are only able to do so a tiny bit: 1/60th. My easement, call of God, of others' burdens, I believe, is to share my JOY in whatever way I possibly can: my words, hugs, laughter, etc.